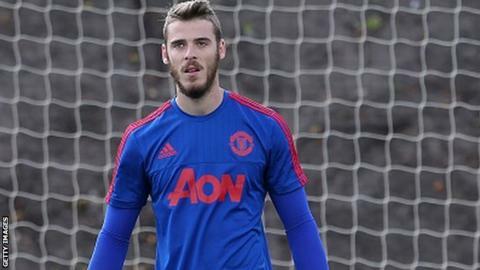 Manchester United are not selling goalkeeper David De Gea before the transfer window closes on 1 September, says manager Louis van Gaal. The Spain international, 24, has been strongly linked with a move to Real Madrid throughout the summer, but Van Gaal says he will stay at United. "I think when Manchester United wants a player he shall come, besides when a club isn't selling," said the Dutchman. "It is the same with us. We are not selling De Gea." De Gea has a year left on his contract. However, he has not been selected for either of United's first two Premier League matches, against Tottenham and Aston Villa, because Van Gaal believes his keeper cannot focus with the speculation surrounding Real Madrid's interest. He will once again be in the stands when United take on Newcastle United on Saturday, with Argentina international Sergio Romero, who has kept two clean sheets, again poised to start.